Quick Take: The Big Bang Theory, "The Isolation Permutation"
Review: The Big Bang Theory, "The Isolation Permutation"
(S0508) Penny and Amy both want to be Bernadette's maid of honor, and when Bernadette takes Penny dress shopping without Amy, Amy has a downward spiral. She disconnects from all social media and electronic contacts, and Sheldon has a sweet moment where he's worried about her and Leonard takes him across town to talk to her in person. He's typically Sheldon about it, but he can see that she's upset and they negotiate something to try to make her feel better: they cuddle. 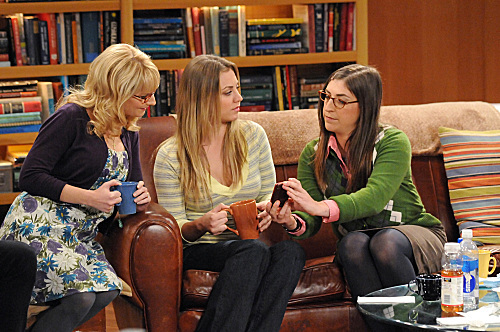 But it's only temporary, and when she's still spiraling, Sheldon makes it clear that the girls need to appologise. It takes a few tries, but Bernadette eventually breaks through the sadness by asking Amy to be her maid of honor. The turn around is instant, and Amy starts planning all the things a maid of honor is in charge of. I love love love that Amy is forcing Sheldon to deal with his intimacy issues, and that he's basically letting her push him. Not much, but there's a little progress, and it's charming in that weird way that this show has when it's on a roll. The cuddling scene was awkward, but not so awkward that it didn't work, and it's nice to see Sheldon getting a little closer to someone, even if he has to be made to do so. It's one of the instances when Amy being a neuroscientist comes in handy, since she probably understands where Sheldon's coming from more than anyone and gets what she needs out of their relationship without being overwhelming to him. Of course, sooner or later, he'll hit a wall, and what will Amy do then? That'll be an interesting day, I think. Amy manages to walk this sharp line between being incredibly needy and incredibly funny. Since the show is basically about a very needy group of people, she can be desperate like this, and so far they've managed to keep her from being really pathetic. This episode could have been a tipping point, and while she was pretty upset and really needed her friends, it's sort of amazing that she also managed to stay fairly reasonable and to fully explain what she meant through it all. Last week was cute, but this week was much more emotionally involving, and so was funnier. It proves that the girls can carry the show as well as the boys can. Now, if they could just get back to whether or not Penny wants Leonard back, and if we could find someone for Raj, we'd have a full party! Am I the only one who thought Raj knows so much about women's clothes because his sister is such a strong personality? I imagine her making him wear her clothes. Also, it was hilarious. Sheldon getting all worked up over Amy was touching and hilarious--and does this mean he really does care about her? I hope so, otherwise, this is all a really extended farce that'll make me sad. I think Amy is really good for Sheldon. She really pushes boundaries but I think he needs that. I love The Big Bang Theory and watch it in HD through my employee subscription all the time. I’m hoping to see more of the Sheldon/Penny dynamic soon but until then, Amy, in small doses, is fun.